This Peregrine Falcon Weathervane in Stoop is a classic visual through most of the world. Did you know that a stooping falcon can reach the speed of 200 miles per hour? That is fast! 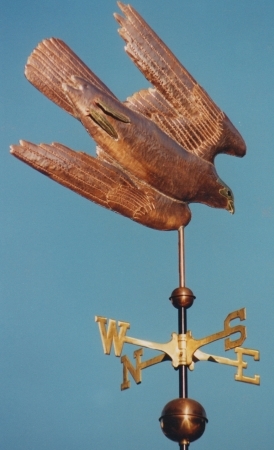 This weather vane was originally commissioned by a hawking club in North America. The sculpture is fabricated in high detail swell bodied style from copper sheet. The pictures show the stooping bird with optional gold leaf detail on some of the feather edging and the beak and face. The feathers are carefully chased in by our amazing team of artists, each of whom have developed their own personal hammers for creating specific textures in the metal to communicate hair, grasses, leaves, feathers, and more. The color for the glass eyes and the decisions for gilding take place with each customer at the time of their order. Gilding with gold or palladium adds bright highlights to the sculpture piece that become increasingly apparent as the copper weathers into darker shades and then patinas. 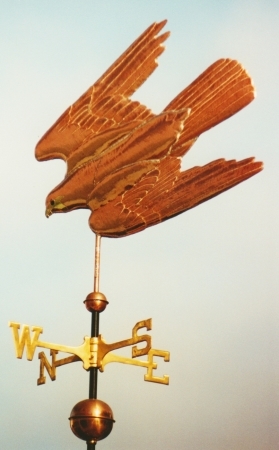 And, of course, you could further personalize this vane, or any of our designs, in the ordering process, before your weather vane goes onto our production schedule.